After that, Varen came over and I made us dinner again (Woolies, naturally - calamari this time, so divine!) and then we headed off to watch The Bourne Ultimatum. 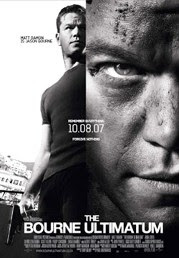 Now, in the new chapter of this espionage series, Bourne will hunt down his past in order to find a future. He must travel from Moscow, Paris, Madrid and London to Tangier and New York City as he continues his quest to find the real Jason Bourne – all the while trying to outmaneuver the scores of cops, federal officers and Interpol agents with him in their crosshairs. Now I'm not a huge Matt Damon fan, but that (and the massage) can't have been the only reason I found myself dozing off in this movie. It was honestly aiming for a Guinness entry for longest chase scene in a movie - I think it'll win too! I dunno, I loved the orginal book and I really haven't enjoyed the movies much. This was no exception. I think they're pretty bland, honestly. Sorry Varen, I know you enjoyed it ;) But I think a mindless movie was what you needed!